Gabe's babes: Deck the halls! Well, there are no "boughs of holly" yet, but we did get a good start at putting up the Christmas decorations this week-end. 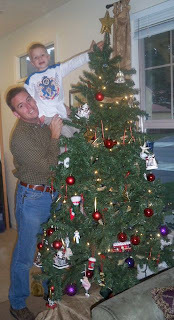 We always have a great time putting up the tree. 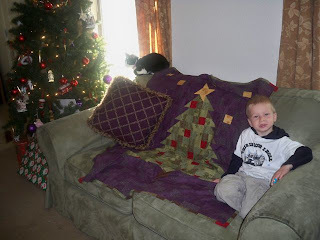 The kids love helping Rob put the tree together. 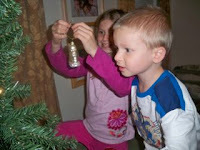 We all enjoy pulling the ornaments out, remembering when we each got our special ones. 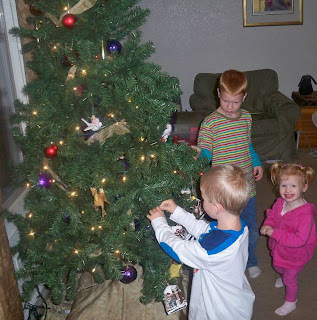 It is so cute to see the kids pick the "perfect" spot for each of their ornaments. other ornaments on. This year was Miss J's turn, but she had a cold and was not in the mood to do it, so Mr. S was more than happy to step in and help us out! 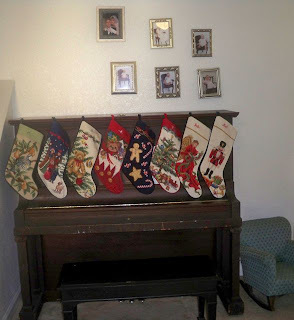 Rob hung all of the stockings up on the piano for us. I think they look so cute there. After we do our gingerbread house we'll put it on top of the piano to fill in the empty space up there.